I want to thank everyone for the personal messages, emails, and facebook messages I received about my latest Christmas short, We Two Kings. I don't think I've ever heard the words 'cute' or 'adorable' to describe one of my shorts as often, but under the circumstances, my movie was intended to give people warm fuzzies for the holidays so I'll accept that as positive feedback, haha. Also notable were the comments about how great the project looked. Like I said in the post, I couldn't have lucked out more with the fresh snow and great weather for a day to shoot. Even I have to admit, the overall look - fake crowns and all - surpassed my own creative expectations. And finally, a lot of you commented on my quirky and irreverent humor - thank you! haha. I couldn't have summed it up better myself, and I'd be lying to say that awkward comedy isn't a personal favorite of mine. Tyler and I play well off each other and I think it shows in the projects he's helped me with. 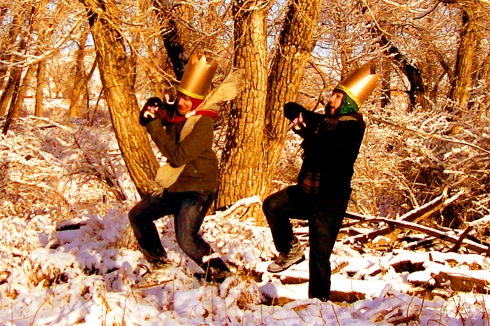 We Two Kings has proven to be a great way for me to close out 2009 and welcome Christmas. Thanks to all of you for checking it out and sharing your feedback, it's been a lot of fun to receive (and please feel free to send more). At this point it's a long way off, but as several of you asked, sequel anyone?